I held out. I waited until I could actually pick up an iPad and handle it. I had to wait until a couple of mall rats stopped playing video games on it. Then it was mine. Unfortunately, the local Best Buy was getting ready to close, so I didn’t really have a lot of time to play with the iPad, but I did answer one question – whether you can use the virtual keyboard to type. The answer is yes, and no, and mostly no. In order to use the iPad’s built-in keyboard as you would when using a laptop, you can’t touch the surface of the surface of the iPad except for the keys. So you perch your fingers like the talons of an eagle, trying to touch type. It can be done, but you have to watch the keyboard, because you cannot rest your fingers on the home keys. Touch typing is on the iPad too tough. Yes, can type out emails and notes, hunting and pecking all the way, but if I were to try to type a Low End Mac column, it would be a real struggle. For extended typing, you’ll want the keyboard. 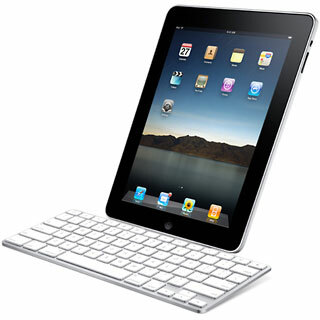 If you want to type on the iPad, you’ll have to invest in the keyboard and dock. Still, you can edit a document on the iPad. I think that you have to honestly say that typing is not the iPad’s reason for existence. So how can you input information the iPad? Nuance is porting it’s speech recognition software to the iPad. I’m familiar with the company’s Dragon Dictation software and the application Read & Write Gold, which my son uses on his computer at college. With vocal recognition software, I can see using iPad to dictate large amounts of written work. Does the iPad take the place of a laptop or netbook? Not if you are interested in using a keyboard to produce text. The iPad is a whole different animal. Critics have written that it is really nothing more than a large iPhone or iPod. This, in itself, is not a bad thing. The larger screen real estate of the iPad turn it into an excellent gaming platform, an effective personal media player, and expands the type of applications that can be written for the iPhone operating system. The big problem I have with critics of the iPad so far is the notion that because the iPad may not be everything they expected, it will fail. But in the future, consumers will use the iPad for things that we cannot even imagine today. Let’s use the iPod as an example. When it was introduced, it was simply a digital music player. Over the years, the iPod has evolved into a complete product line, iTunes has turned into a huge Internet business, and the iPhone and iPod touch have transformed the smartphone and PDA markets. Let’s just wait and see what the iPad can do over time; Apple and Steve Jobs have a proven track record on creating “must have” items. I see a lot of niche markets that the iPad can fill right now – and as time passes and more applications are written for the iPad, I can see that it will not suffer the fate of becoming the next Apple TV. Do I want one? I want to wait. I waited until the iPod touch came out to buy my first iPod. I think that the other thing that the iPod story tells us is that as iPad develops it will gain features and drops in price. Me? I want a built-in camera.